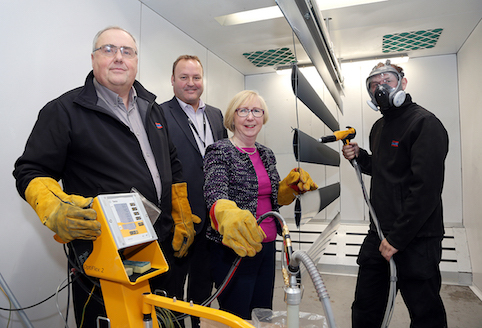 L-R: Karl Prosser, Mark Wheddon, head of delivery at the University, Maggie Throup and Darren Barker, welder/fabricator at Dales, at the penultimate part of the process where the coating is applied. Industry specialists and Erewash MP Maggie Throup were among guests who attending the unveiling on Friday (Nov 30). Maggie, who has a scientific background, said: “The chemistry behind this is really exciting and at the same time it’s allowing Dales to have complete control of the quality of their excellent and innovative products.